Steve Lichty’s family runs a dairy farm in Beaver Dam, Wis. that is at risk of closure due to a dispute over Canadian policy. Just seven days remain until Steve and Dori Lichty's dream collapses. On May 1, the truck that picks up the milk from their small dairy farm will stop coming. For a few days at most, they will keep milking their cows, hoping to buy time. But then it will be over. They will call other farms, trying to divide up and sell their cows, and failing that, send them to a stockyard for slaughter. In his mind, Mr. Lichty pictures the cows walking out of his barn for the last time and does not know how he will handle it. The story of how milk emerged as a flashpoint in a new war of words between the United States and Canada starts with the plight of families such as the Lichtys, whose livelihood now hangs in the balance. Earlier this month, Mr. Lichty walked down the long driveway to his mailbox, where he found a one-page letter from the dairy processor that buys the farm's milk. The letter, delivered to nearly 60 Wisconsin dairy farms, said that as a result of a decision by the Canadian government, the processor could no longer buy their milk. The letter received by dozens of Wisconsin dairy farms telling them their milk was no longer needed because of a change in Canadian government policy. That letter set off a chain of events that led all the way to the President of the United States, who happened to visit Wisconsin on April 18. The dairy dispute has caught Donald Trump's attention: Over the past week, he has repeatedly decried Canadian policy. In an interview on Friday with the Associated Press, Mr. Trump said dairy farmers in Wisconsin and New York are "getting killed" by the North American free-trade agreement. The spotlight has taken some in Wisconsin by surprise. "I've been in agriculture all my life," said Pam Jahnke, a long-time farm broadcaster based in Madison. "I think I can count on one hand how many times I've ever heard a president talk about dairy, let alone Wisconsin dairy." Mr. Trump's remarks during his visit to the state were the culmination of weeks of intense effort involving local farmers, dairy-industry officials and state elected representatives. Wisconsin, a small state where the license plates read "America's Dairyland," is in an unusually good position to make its case heard. It was crucial to Mr. Trump's narrow election victory in November. Mr. Trump's Chief of Staff, Reince Priebus, grew up in Wisconsin, as did Paul Ryan, the Speaker of the U.S. House of Representatives. At the heart of the current conflict are Canadian rules governing the dairy industry. Provincial milk marketing boards are introducing a new classification for a type of milk concentrate used to make cheese, which gives companies an incentive to buy the domestic version rather than use imports from the United States. In a report issued in March, the office of the U.S. Trade Representative said that it had communicated its "serious concerns" with the policy changes to the Canadian government and the World Trade Organization. The story might have remained a relatively obscure trade tension were it not for two factors: the abrupt move by Grassland Dairy Products, a Wisconsin processor, to drop dozens of dairy suppliers, and the flush state of the Wisconsin dairy supply. 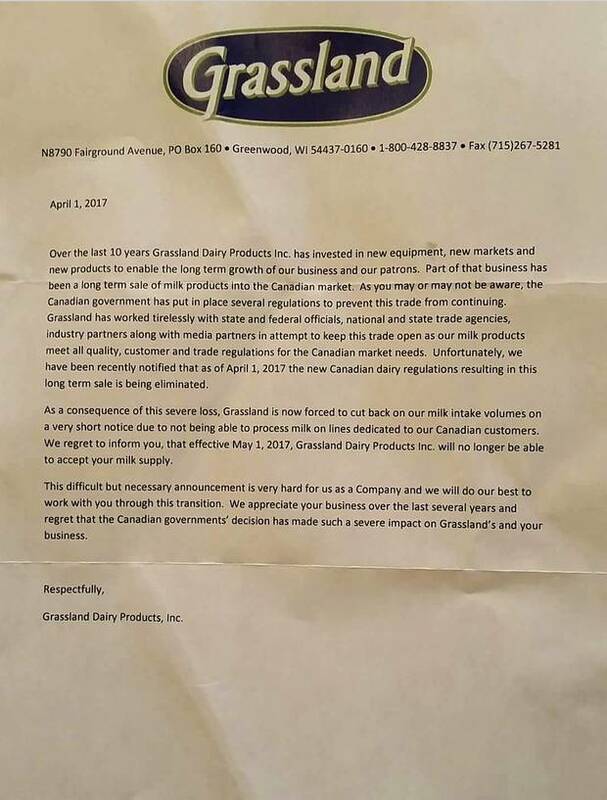 In the letter dated April 1, Grassland said that it had suffered a "severe loss" of business due to regulatory changes in Canada and was "forced to cut back on our milk intake volumes on a very short notice." A Grassland spokesperson did not respond to a request for comment. For the farms that received the letter – 58 in Wisconsin and nine in Minnesota – it came like a bolt out of the blue. None of the farmers had even heard of the classification issue. Now, they had to scramble to find a new processor with 30 days' notice during the spring milking season, when production is at its peak. In the past, getting a new processor was not a major hurdle. But as farmers such as Mr. Lichty began frantically calling around the state this month, they kept getting the same answer: We're already at capacity and can't take any more milk. Steve and Dori Lichty and their son Winston, 3. "We appreciate that [Canada] is trying to protect its own, but it couldn't have come at a worse time," Dori Lichty said as she surveyed the family's herd of several dozen cows on a recent evening. "We have an oversupply of milk in the U.S., and especially in Wisconsin." The 23 major dairy states produced 17.5 billion pounds of milk in March, a record. John Pagel, president of the Dairy Business Milk Marketing Cooperative, said 21 of the impacted 58 Wisconsin farms have found new buyers for their milk. His group is working against the clock to find help for the others, such as the Lichtys. Carrie Mess, a dairy farmer in Watertown, Wisc., has friends, neighbours and relatives who are affected by the Grassland decision. None of them have found a new buyer, forcing some to consider closing farms that have been in their families for generations. Ms. Mess threw herself into action after the initial letter arrived, appealing directly to Paul Ryan in a post on her popular dairy blog. On April 7, she joined a conference call with staff members for Mr. Ryan and Wisconsin's two senators, as well as representatives of the dairy industry, to apprise them of the situation. In short order, a flurry of letters began flying from industry groups and politicians to the Trump administration. On April 12, Mr. Ryan spearheaded the drafting of a letter signed by the entire Wisconsin congressional delegation to the Commerce Secretary, the acting U.S. Trade Representative and the acting Agriculture Secretary. It urged them to "take immediate action to address this dire situation where apparent unfair trade practices are putting Wisconsin dairy farmers' livelihoods at risk." Wisconsin Governor Scott Walker and New York Governor Andrew Cuomo sent a letter directly to Mr. Trump containing more strident rhetoric. Wisconsin and New York are "only the first victims of Canada's illicit dairy-trade restrictions," the governors fumed. The Canadian government and dairy industry had plotted "a trade war against our nation's dairy farmers." Mr. Walker said he planned to speak with Mr. Trump privately about the issue on his visit to Wisconsin, the Associated Press reported. Mark Stephenson, an expert on dairy policy at the University of Wisconsin-Madison, said that Canada will not volunteer to back down on the issue, and he predicted that the United States would consider taking the dispute to the World Trade Organization, where it could take years to resolve. Meanwhile, he believes that the oversupply in the market could ease up within a few months. But "that's not a solution for these farmers who are without a market," he said. "I don't think they could manage much more than a week or so dumping milk." For Steve and Dori Lichty, the options are running out. Both grew up on dairy farms and have spent years realizing their dream of having their own operation. They bought their first cow together just days after they were married in 2004 ("There goes the honeymoon," quipped the auctioneer, Mr. Lichty recalled). They rented farms for nearly a decade and finally bought their own three years ago, a sloping property with a view of a nearby lake. Mr. Lichty, 42, rises at 1 a.m. to start chores and milk the cows, then goes to a part-time job early in the morning before returning to milk the cows a second time. Ms. Lichty, 37, works for a bull stud company, a business she fears will be affected if dozens of dairy farms shut down after May 1. When their daughter Vivian, 7, learned they might have to sell the cows, she burst into tears. "It's just sickening and tough," Ms. Lichty said. "We're losing everything we worked for because of something totally out of our control." 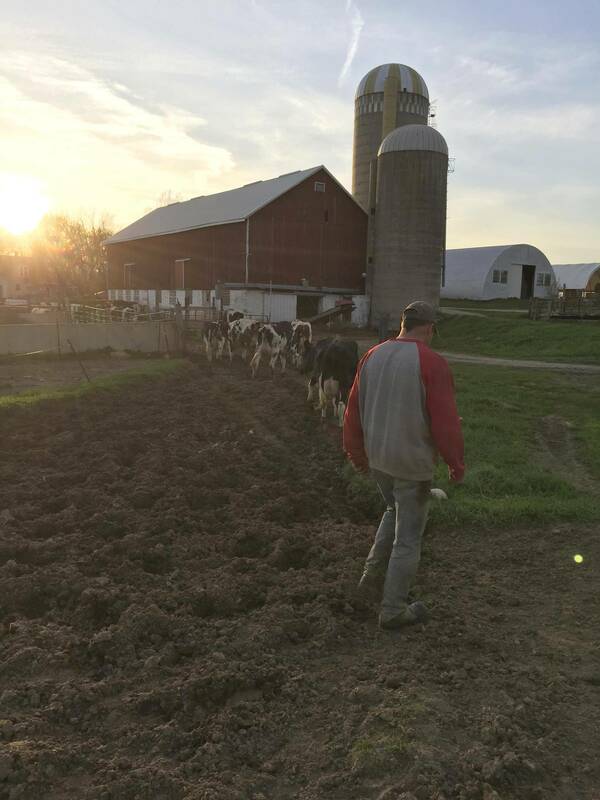 As the sun set, Mr. Lichty gathered the cows from the pasture and herded them back to the barn. "We pray and we hope," he said. "That's all we've got left."